Item # 157533 Stash Points: 13,999 (?) This is the number of points you get in The Zumiez Stash for purchasing this item. Stash points are redeemable for exclusive rewards only available to Zumiez Stash members. To redeem your points check out the rewards catalog on thestash.zumiez.com. Upgrade your style with the undeniably sophisticated GA700 grey camo watch from G-Shock. Coming with a bold camouflage pattern on the case and band, this modern timepiece offers a spectrum of functions including a 300 meter water resistance, multiple timers and a day/ date window. 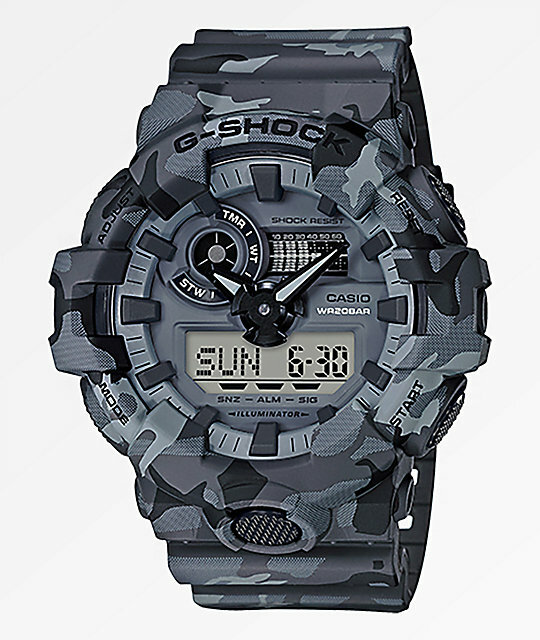 GA700CM-3A Grey Camo Analog and Digital Watch from G-Shock. 1/10th Second Stopwatch w/Speed Indicator. World Time with 31 times zones. Countdown timer range: 60 minutes. Approx. battery life: 5 years. Size: 57.5 X 53.4 X 18.4mm, Weight: 69g.